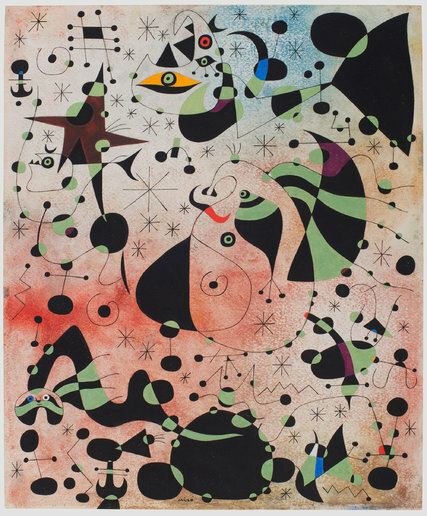 Joan Miró‘s “Sunrise,” from his “Constellations” portfolio. An unusual stillness also characterizes Miró’s “Constellations”: The silence of the cosmos. When he began the series, Miró was anguished. The fascists under Franco had occupied Catalonia early in 1939, and soon afterward overturned the Spanish Republic that Miró and his friends supported. He retreated to Varengeville-sur-Mer, a village in French Normandy. He brought a pad of modestly sized watercolor paper — 15 inches by 18 inches. Tearing off a sheet, he rubbed it with oil and gouache, over which he laid an intricate pattern of biomorphic, brightly colored forms and curling black tendrils that he strung with small shapes. 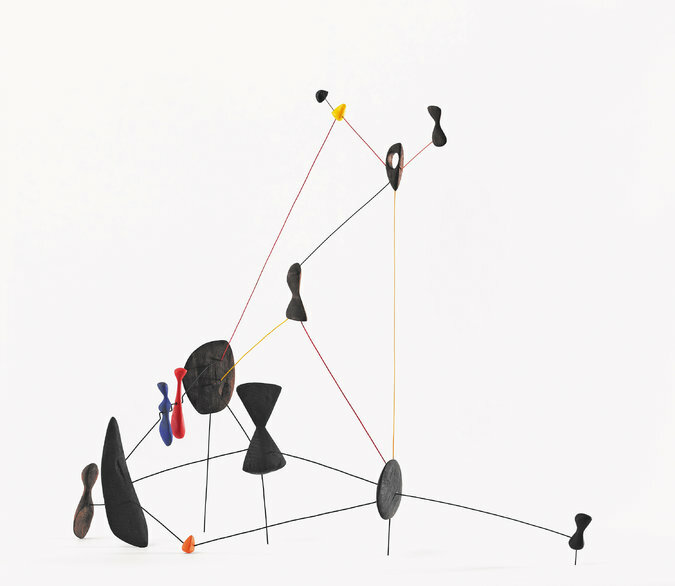 Alexander Calder’s “Constellation With Diabolo,” from 1943. In May, the Germans began bombing Normandy. As the Mirós fled first to Paris, then to Perpignan, Barcelona, Palma de Mallorca and finally to the family farm in Mont-roig in Catalonia, Joan’s wife, Pilar, took charge of their small daughter, Dolores, while he carried the satchel that held his precious works in progress. As the series advanced, the more menacing forms of the earliest paintings gave way to beatific images. In Palma, where Pilar’s parents lived, Miró would spend some mornings listening to organ music and admiring the stained-glass windows in the cathedral. “In negating negation, I affirm,” he later declared. Miró finished his “Constellations” in Mont-roig in September 1941. Not long after, at his studio in Roxbury, Conn., Calder fashioned a collection of sculptures in which hand-carved wooden forms, some painted, others not, were held in place by metal spokes. Consulting with Marcel Duchamp and the curator James Johnson Sweeney, Calder called them “Constellationes,” adding a mysterious final “e” to create an idiosyncratic coinage. Miró’s “The Passage of the Divine Bird” (1941). The 1945 exhibition caused a sensation in New York art circles. Indeed, some critics believe that the “all-over” style of painting that Jackson Pollock adopted in 1947, extending his forms over the entire canvas without conferring priority to any one area, came in response to seeing the Mirós. 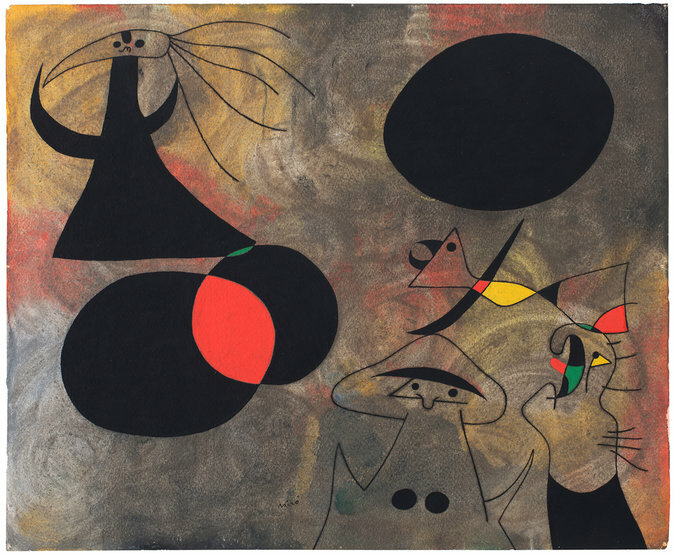 Even though he used “constellation” in the name of one of the paintings in the series, Miró did not refer to the group that way; but by the late 1950s, the Mirós, like the Calders, became known under that rubric. It is natural to think of the two bodies of work, created in the same period, as linked. To display them together, however, posed nearly insuperable challenges. Marc Glimcher, whose family-owned Pace Gallery represents the Calder estate, concluded that his firm might be able to round up many of the Calder “Constellations.” But only the Acquavella Galleries — which, with the backing of Sotheby’s, acquired the holdings of the Pierre Matisse Gallery (including 550 Miró oil paintings) after Matisse’s death in 1989 — could possibly gather the Miró counterparts. 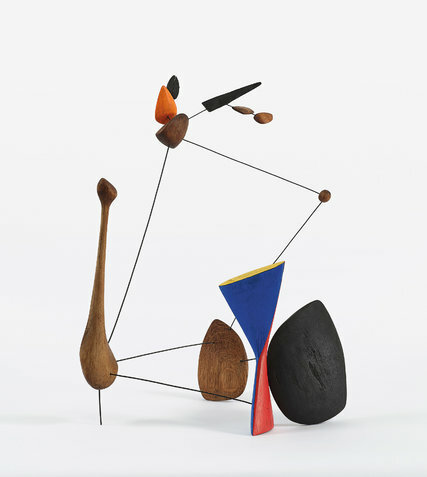 Because the Miró and Calder works are fragile, securing the loans was difficult. “There were lots of ‘Noes,’ and many phone calls,” said Arne Glimcher, Marc’s father. It became an amicable rivalry between the two galleries. Once Acquavella reported — prematurely, as it turned out — securing all the Mirós, Pace scrambled even harder. It helps that while the galleries are friendly competitors, the two heirs who control the artists’ estates are, like their grandfathers, purely friends. They met in 1995, when Mr. Punyet, who was studying at New York University, noticed a letter in a gallery at which he was interning that had arrived from Alexander S. C. Rower, Calder’s grandson (who, like the artist, goes by the nickname Sandy). Mr. Punyet photocopied the return address and wrote to him. He didn’t know that Mr. Rower had been writing over the years to Dolores Miró in Palma, with no reply. Mr. Rower called Mr. Punyet upon receiving the letter, they met for dinner that night, and they have been close pals ever since. Mr. Rower, who is 53, has been coping with such tension since he established the Calder Foundation in 1987. “I felt there was an urgent need to make an archive,” he said. He observed that curators were drawing on just a few hundred Calder works when they assembled exhibitions, instead of considering the full 22,000 pieces his grandfather had produced. 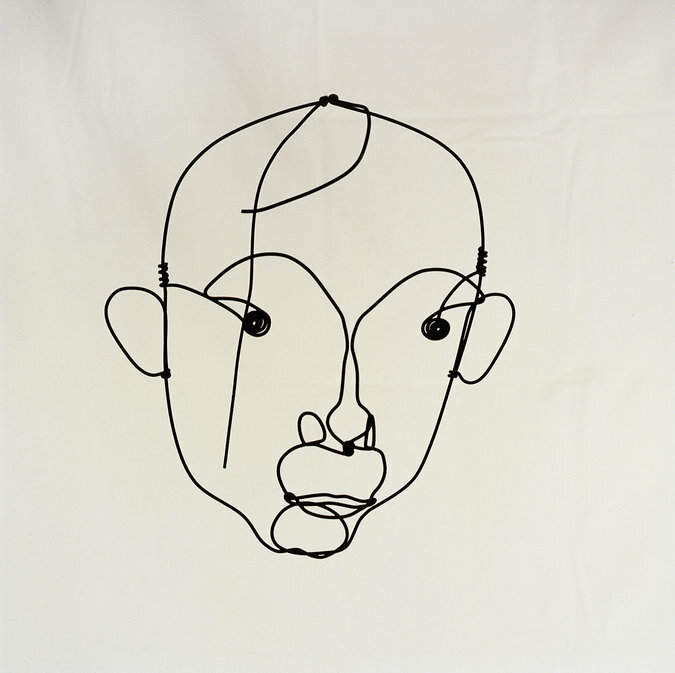 Calder’s “Portrait for Joan Miró,” circa 1930, is made of wire. A visitor to the two galleries, about a mile apart, can experience the “Calder/Miro: Constellations” as they were created — separately, but in sync. Miró was precise on how he wanted his paintings shown: in chronological order, on white walls, in simple frames. Acquavella honored those directions, except for the framing. Conservation requirements were too strict to permit the paintings to be uniformly remounted. Because one lender backed out at the very last minute, the Miro “Constellations” show comprises 22 paintings and one print. The Calder “Constellations” are a looser body of work than the Mirós. Calder is thought to have made about 29, and Pace has complemented them with other pieces, for a total of 36 sculptures. None of the “Constellations” at either gallery are for sale, although such noncommercial megashows have a way of boosting an artist’s future prices. Marc Glimcher asserts that in addition to exploring artistic affinities, these two shows demonstrate that despite frequent reports of cutthroat competition in the art world, dealers can still collaborate. “In the old days, there was an amazing fraternity of the people who made their life in art,” he said. And sometimes, when the stars align harmoniously, that spirit of camaraderie can return.